He only wanted to make the world a better place. To stop us fighting, arguing, wasting our time on petty disagreements. He thought it would help. And it did, for a while. People were kinder and gentler. They laughed with each other, they played games, they enjoyed life. But soon, that was all they did. Then the memories started to disappear, and before long they couldn’t do anything, not even take care of themselves. And by then it was too late. No-one who could have reversed the effects had the brainpower any more. Goodnight humanity. 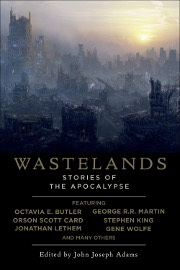 Thus runs Stephen King’s gloriously bleak ‘The End Of The Whole Mess‘, the first tale in Wastelands: Stories Of The Apocalyose, a diverse collection of post-apocalyptic short fiction from the master of the sci-fi compendium John Joseph Adams. King’s story, narrated in diary form by one Howard Fornoy, tells of how his genius younger brother Robert inadvertently brought mankind to a grinding halt. In an attempt to alleviate our more violent instincts he researches a chemical synthesised from water in the mysteriously peaceful small town of La Plata. Using a volcanic eruption to disperse the ‘cure’ around the globe he is at first elated by the effects. All too late he realises that it doesn’t stop there – the drug eventually leads to a state indistinguishable from Alzheimer’s. The final few journal entries by Howard are a respectful hat-tip to Daniel Keyes’ heartbreaking classic Flowers For Algernon as the narrator’s own mental powers slowly slip away. Post-apocalyptic fiction usually carries a reputation for being excessively dark – grim and nihilistic are the order of the day. However by corralling 22 stories from some of today’s finest SF/Fantasy authors, John Joseph Adams has turned Wastelands into a vehicle from smashing such stereotypes into the dust. Yes, there are some ultimate downers to be found in these pages, Paulo Bagiaculpi’s ‘People Of Sand And Slag‘ being one example which may have you reaching for the Kleenex. It’s not all doom and gloom though, there is comedy to be found as well as sheer aching beauty in some of these visions of the future. The apocalypse can take many forms, such as the one encountered Octavia Butler’s silent ‘Speech Sounds‘. She imagines a disease sweeping the world and removing the ability to communicate. To differing degrees people suddenly find themselves robbed of speech and handwriting skills but otherwise unimpaired. The paranoia instilled by a sudden total dependence on body languages and the ambiguities which lie within soon has the world in flames. The intellectually isolated population tries to get on as best as it can but find that it’s difficult to live in a world where even an apparent favour from a stranger could be fraught with danger. An old favourite of mine, Cory Doctorow’s ‘When Sysadmins Ruled The Earth‘ makes a welcome appearance in Wastelands. By turns dark and yet comically surreal it foists an almost slapstick, accidental armageddon upon us. One freak occurrence leads to panic in another area, setting off riots which trigger a terrorist attack which leads to an overreaching response – you see where this is going. In the space of a single evening every government and terrorist group has unleashed their arsenals, carpeting the world in nuclear, biological and conventional devastation. Our hero, Felix, is called to his Toronto data center just as events are picking up. One of the first manifestations of the looming catastrophe is a worm knocking out his routers and as sysadmin he slumps out of bed, leaving his wife and daughter behind, and gets to work. It’s the last time he sees them alive. Safe inside the vault-like server storage unit, he and his other nerd friends weather the events in safety. Piecing together what they can by communicating with similar safe havens around the globe they proceed to construct an internet-based government to cope with the disaster. Unfortunately it transpires that getting geeks to agree on politics is a process similar to herding cats.